Albert Einstein is probably the best-known scientist of the 20th century. He’s a great creative thinker whose ideas have changed the world, defined mankind and inspired millions. Einstein was a brilliant man who was passionately curious about physics and philosophy. In 1921 he was awarded the Nobel Prize in Physics. He wrote more than a dozen books, more than 300 scientific papers and more than 150 non-scientific works. Albert Einstein has been called the most creative genius of the last century. He started his career as a patent office clerk, where he learned how to analyze creative ideas and examine them in his mind. He began to move into the unknown of his ideas through his imagination, rather than knowledge. Too often knowledge becomes a barrier based on beliefs of yesterday for the things that didn’t work. Only imagination can find open doors that might have been ignored. Without the curiosity of questions, there would not be room for wonder. Albert Einstein was constantly asking questions, clarifying things and thinking how things were connected with one another. He would ask the questions about things that others would ignore. If you want to be more creative—be more curious. Ask more questions. It took more than seven mistakes in a period of about 40 years for Einstein to prove the theory of relativity (E=mc2). Mistakes are fundamental to exploring new territory. 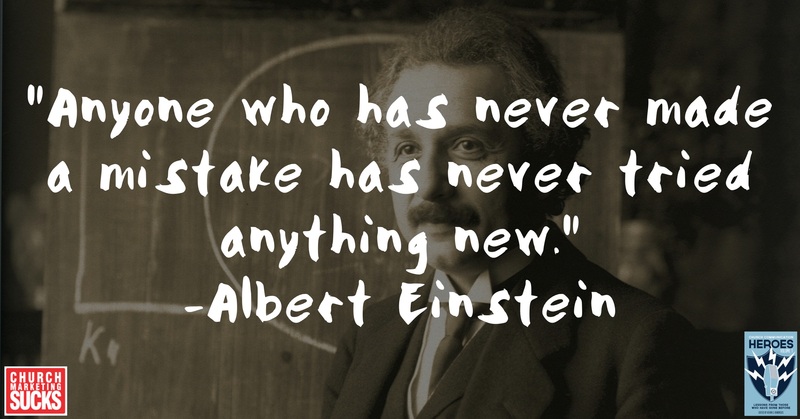 It would have been very easy for Einstein to allow the fear of making mistakes to stop him from some of his greatest inventions. Mistakes are experiments that eliminate an option. Einstein believed that staying with a problem longer could make the difference between failure and success. Perseverance played a very important role in his success. So many people never reach their goals because they give up right before the finish line. It has been said that the difference between creativity and imagination is action, and Albert Einstein was a reflection of this very same concept by putting his creativity into motion time after time. So embrace your imagination. Keep on asking questions. Make bold mistakes. And see things through. These lessons can drive us as we push our churches forward communicating the story of the one who created the very universe Einstein worked so hard to describe. Read about more heroes in our ebook, Church Communication Heroes Volume 1.